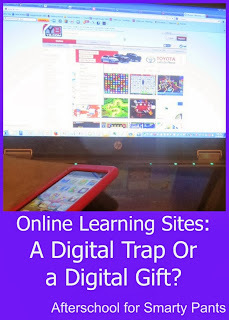 Home » parenting » stem-activities » A Digital Trap or a Digital Gift? Do you use online learning or learning apps at home? This question almost never get asked in conversations between parents here in Silicon Valley. Conversation usually revolves around which apps are most popular for toddlers, how far a kindergartener progressed in MineCraft or a second grader’s latest project in Scratch. Parents themselves spend an inordinate amount of time online – working, researching, playing, networking, or blogging. Kids in restaurants are usually very well behaved – completely engrossed in their nice electronic bubbles of iPads and Nintendos and not paying any attention to the world around them. But learning apps are good for kids, right? I subscribe to Times Magazine and one of the latest issues had an interesting article titled The Digital Parent Trap: Should your kids avoid tech – or embrace it? The article is available online only to Time subscribers, but in general the article argues in favor of technology use in the classroom and at home. The article went on to say that children learning on computers retain more of what they learn, can interact with people around the world who share the same interests, and master valuable skills that will be required in their future jobs. What did we do in preschool? We don’t believe in any kind of screen time for children under 2. Both my husband and I think that young kids should learn through interaction with human beings, not with screens. When our daughter was older, we started to spend some shared time on Starfall to solidify her knowledge of letters and numbers. Even later, when she was 4, we subscribed to Dreambox and watched Smarty’s already strong math skills explode. Again, initially we spent time on the site together and established some rules before letting her progress on her own. DreamBox (paid subscription) – we are currently not subscribed as Smarty progressed out of the level for lower grades and doesn’t like a new interface on the level for higher grades. ABCya! – free, and activities are nicely split into grades. Raz-Kids (paid subscription through school) – a site for leveled reading used by our school district. Students can login from home with their IDs. Smarty rarely uses it at home since she doesn’t want to “waste” her precious screen time, but the site is rather good. Cool Math Games – Smarty’s current absolute favorite. She loves variety of games there, but I dislike the amount of surfing she does dropping one game that is “too hard” to try another game. This is, by the way, is also a problem with iPad apps. How do you manage screen time at home and what are some of your favorite online learning destinations? I'm aware of all the latest, hottest games out there because so many people use them. And we've tried Dreambox which I loved, but compared to actual hands-on learning with a parent, it failed miserably. There is something to be said for face-to-face interaction. We go back and forth on screen time, there are many benefits to it, but also many downsides. I'm on one of my "cut down on screen time" kicks for the kids. I figure they will get enough of it later on. I love your new look here!!! Very interesting post!!! My kids watch tv and use other electronics, but we limit it quite a bit. NO video games (educational or not) on school nights and only family tv (all of us watching together) on school nights. On weekends and during vacations, we are more relaxed about it, but honestly, my kids would rather play outside with neighborhood kids than watch tv. I can't say the same for Tyler - he's 16 and likes to be glued to a screen which is why we do not allow televisions in bedrooms and his phone is plugged in at night outside of his room. He is pretty busy with sports, school, and his job, so I don't mind him playing games a bit when he is home. Sometimes it is hard to find the perfect balance with technology. I know we are beginning to use more, though Selena has always had her TV to watch. I do know she has learned lot from the TV that I chose for her to watch. I love the range of approaches you covered here. You are my go-to resource for electronic learning when we do use it! What a wonderful post!! We have been wrestling with screen time at my house as well. We just switched from a Waldorf school to a traditional school and now screen time is up to us more than ever. Thank you for sharing at Sharing Saturday! Electronics and television are controlled substances here, but we still use them quite a bit. Our current favorites are Reflex Math (subscription) - using it to solidify TB's Multiplication and Division facts. I like that they teach them in fact families. Dance Mat Typing - (free online) - we're working on TB's typing skills to support his online History class. Duolingo (Spanish) free on the iPhone to support his Spanish enrichment classes. We're also using the "Word Roots" series from Critical Thinking Co. to practice word roots, prefixes and suffixes. What an interesting post. Technology is a fabulous tool when used thoughtfully.